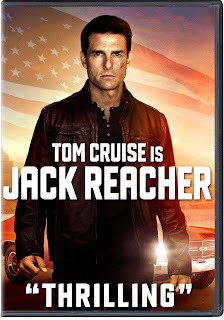 Not having read any of Lee Child's Jack Reacher novels, I'm in no position to argue for or against Jack Reacher the film's fidelity to the source material. Well, apart from the fact that the character of Jack Reacher is 6'5" with blond hair while the actor playing Jack Reacher (Tom Cruise) in the adaptation of Child's One Shot is at 5'7" (officially) almost a foot shorter as well as brunette. I won't belabor the point because Tom Cruise did an excellent job as Reacher, a character I like to think of as a tough, military version of Sherlock Holmes (I'll get to that in a bit). Jack Reacher is an entertaining film with a strong plot (though it was a little opaque at times) and with good performances from almost everyone involved. There is a mass shooting in Pittsburgh: five random people are shot by a sniper. Soon the police with efficient work apprehend the prime suspect, one James Barr (Joseph Sikola), former Marine sniper. The conclusion Detective Emerson (David Oyelowo) and District Attorney Alex Rodin (Richard Jenkins) is that he is the killer. Barr won't confess to the crimes, but instead writes a cryptic note with three words, "Get Jack Reacher." Said Reacher sees the news of the shooting and Barr's arrest, and comes as quick as he can to Pennsylvania. While Barr's defense attorney (and daughter) Helen (Rosamund Pike) at first thinks this mysterious figure might come to help her client, Reacher is not there to save him, but to make sure he is convicted. However, he agrees to be her chief investigator, even if it means doing odd things like visiting the victim's families. It' not for me to say, but certain plot elements of One Shot/Jack Reacher are similar to Agatha Christie's The ABC Murders. In that novel, there appears to be a serial killer who targets seemingly random people based on the first letter of their last name if memory serves correct. In the end, Hercule Poirot finds that far from being a series of random crimes, the murders were actually committed to hide ONE particular murder and make it appear to be the work of some serial killer. Similarly, Jack Reacher has a major shooting only to find that this was a way to cover up the targeting of a particular victim. This is what I thought of while watching Jack Reacher, but I won't get hung up on this detail. Instead, let me focus on what made Jack Reacher enjoyable to watch. First, I congratulate Tom Cruise on his performance. He maintained a cold, methodical manner to Reacher, a man who keeps a focus on things and rarely if ever lets his emotion get in the way. I spoke earlier on that I thought he was a military Sherlock Holmes. What I noted about Reacher is that he would focus on tiny detail that escaped everyone but which Reacher showed Helen (and us) how we were both wrong and missing important things. For example, when Helen gives reports from all the victims, we are suppose to focus on the lives lost. Reacher, however, notes the odd things. Helen figures that one victim bought flowers for his wife after a fight, but Reacher notes that the flowers were bought in the morning. If they were for his wife, Reacher surmises, the husband would have bought them in the evening so they would be fresh. Another victim, we're led to believe, did not want a major purchase of a watch noted on her credit card so as to surprise her husband. However, given that said purchase was made near the end of the billing cycle, it would not have shown up on the bill until AFTER it was given. Therefore, these two victims who happened to be at the same place at the same time, did in fact know each other. In fact, they were having an affair, which is why the woman moved forward when the man was shot, rather than away. The fact that this was a false road which was irrelevant to the overall plot irritates me some, but it does show Reacher's high intelligence. Yet I digress. Cruise makes Reacher a cold and brilliant figure, one who is direct and uninterested in the niceties of society. If he has to get information by just asking for it, he will. However, he does have a semblance of a heart: Sandy (Alexia Fast), a girl who has gotten herself involved in this case, is warned to leave town for a few days by Reacher, who sees that she really is being used. When he learns that Sandy has indeed been killed to keep silent, a brief moment of pain actually flashes through him. It's a credit to Cruise as an actor (and sometimes we forget that he is a good one...and sometimes HE forgets he's a good one) that we can see occasional moments where a bit of humanity flashes beneath Reacher's methodical and cold manner. This Reacher is methodical, a bit arrogant but always a step ahead of almost everyone. Even when he's being humorous it appears almost menacing. "Three things cops won't do," he tells Helen. "Cops won't vote Democrat, won't drive Cadillacs, and they never use personal vehicles." I can't be certain that cops don't actually do any of these things, but as far as he's concerned he's almost always right. As for his height, I found it a plus: there is something impressive about someone small taking down taller men with almost the greatest of ease. Duvall was great in a mixture of wise elder and comic relief as the shrewd but slightly cantankerous Cash. Werner Herzog is a genius: we've seen it in Aguirre, The Wrath of God and Fitzcarraldo and Grizzly Man and Cave of Forgotten Dreams. As such, if he wishes to be this vague super-criminal then he gets a free pass from me. As the major antagonist with whom Reacher has a climatic fight with (in the rain, no less) Jai Courtney was good...can't complain. He had a cold manner that matches Reacher's except he is for evil rather than justice (Reacher was not necessarily good, just on the side of the right). The only person with whom I had trouble with in terms of performance was Pike's Helen. I kept wondering why is this woman so dumb. Time and again Reacher provides her with logic and proof that what he was thinking was correct, but time and again Helen doesn't appear to either understand or believe that Reacher's theories make sense, let alone are accurate. I also could not figure if a fight sequence where Reacher is for once taken by surprise didn't have a bit of intended comedy. Two henchmen manage to surprise Reacher, but they prove so inept (for example, both of them struggle to fit through a door at the same time) that I was beginning to wonder whether this was just a bit odd if not downright silly for something as serious as Jack Reacher. I wasn't sure whether writer/director Christopher McQuarrie intended this sequence for laughs. Some of Reacher's escapes (such as when he evades Emerson's officers after an admittedly well-made chase) seemed far-fetched if not unbelievable. Finally, the 'actual inside man's' motivations were unclear. In fact, I don't think they were ever explained (apart perhaps, from money), so when he is revealed, we wonder why.